Like a lot of people these days, organized religion doesn’t do it for me, with its rigid rituals and dogmatic positions. Since reading Nietzsche as an undergrad, I have thought like him that Christianity and morality are problematic. I interpreted his statement that “God is Dead” to mean the Christian God was no longer going to meet the needs of most people in the 20th century, but as to the actual existence of a higher power, Nietzsche was just a mortal like the rest of us, and the answer is still shrouded in mystery. Along with karmic justice and an afterlife, these three beliefs form the basis of my faith, and have not been ruled out by science. As I enter the second half of my life, and can see the brevity of our time here, and have lost some loved ones I had in my youth, I don’t know how you deal with these tragedies without believing in something. The solace that we will see our loved ones again, and that all our effort to learn, love and grow will not be ultimately meaningless and just reduced to dust, and that the end is something to look forward to, provide a meaning to our pilgrim’s journey here that science, math and statistics can never give. Unlike organized religion, I believe the diety to be non-denominational, and not just for some sect you were fortunate enough to be born into, and to be accessible to anyone with an open heart, and that have the courage in this science obsessed society to dare to believe. The alternative is just the random, chaotic, meaningless existence that science proposes and which provides little comfort as we inevitably pass through the life cycle with its certainties of aging and death. The beauty and mysteries of nature and the universe suggest an architect to me, and therefore a purpose to our lives beyond the random and absurd. If these thoughts appeal to you may I suggest you check out my other newsletters on this site. 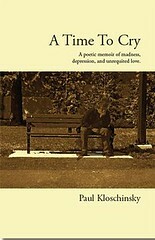 Paul Kloschinsky was born on Saskatchewan in 1963. He was trained as a physician and practiced as a General Practitioner for a time. For a period in the past he suffered mental health problems. He now lives in Delta, BC.and is an avid poet, songwriter and photographer.